On this page I will give you basic facts about the Potato Famine in Ireland. In a box further down the page you will find links to other articles covering the famine in more detail. 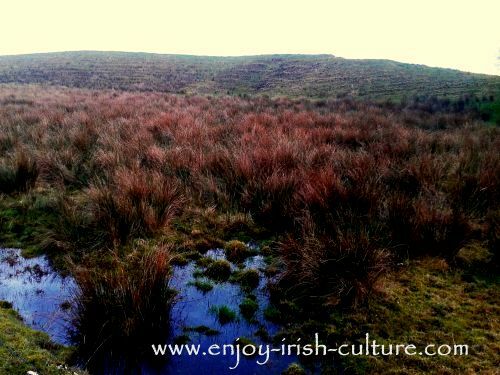 A boggy patch of land in County Roscommon. Note the parallel lines- the so called 'famine ridges'. Starting in the 17th century and continuing until well beyond the Famine, potatoes were the main staple for the poorest peasants. They were often grown in so called 'lazy beds' which worked well in poor or shallow soil. The farmer did not have to turn the sod, but dropped the seed potato in behind the blade of the spade. The Potato Famine in Ireland started in 1845 and continued until 1852. This was not the first Irish Famine by any means. Famines due to the failure of the potato crop had occurred before in Irish history, such as a large scale famine in 1741. The last one preceding the Great Famine occurred in 1839. The counties hardest hit by the famine were the westernmost counties of Sligo, Mayo, Roscommon, Galway, Kerry, and Cork. Tim Pat Coogan estimates Famine deaths to have been in the region of 2 million. This figure was commonly quoted as 1 million, but, he says, in many situations whole families would have died and there was nobody left to record the deaths. Out of a population of between 8 and 9 million, this would make it 25 to 30 percent of the population. People died from starvation and famine related diseases such as typhus and cholera. The relationship between famine and such fevers as well as the process of starvation were documented for the first time during the potato famine. All over the country you can still see abandoned cottages without a roof returned to bare stone walls. Some are used as sheds as the one above. 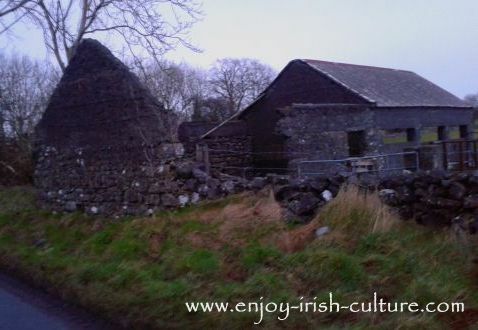 Many abandoned cottages date back to the potato famine when evictions and emigration cleared large stretches of land, and there are many more from a hundred years of continued emigration. More than one million people emigrated during the potato famine never to return to Ireland. If they survived the boat trip riddled by starvation and related diseases, they started new lives in England, America or Canada. Approximately a third of the population of Ireland was living in dire poverty. When their only food, the potato staple, failed, they had nothing to eat at all. Many died directly from starvation, especially vulnerable people such as children and the elderly. Many more died from famine associated diseases such as cholera and typhus which spread rapidly in overcrowded conditions such as in workhouses, and when people were left roaming the roads with nowhere to go. About the real extent of the poverty in Ireland in the period leading up the the Irish Famine. 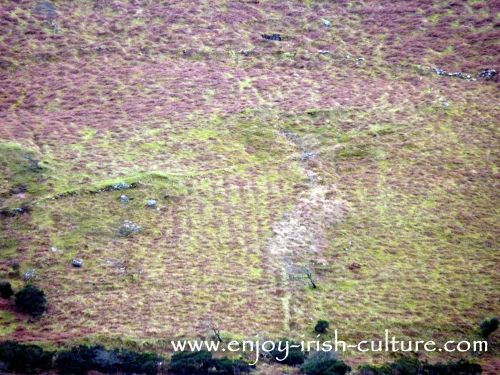 A couple of centuries of potato monoculture have left traces in the landscape like here on a steep Connemara hillside in County Mayo. Potatoes were the only food for about a third of the population. High population density meant they had to be grown even in the most shallow and infertile patches of soil. 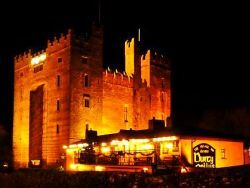 There was a prevailing attitude in England, especially among the upper classes and reflected in the press of the time, that the Irish had caused their own misfortune by being lazy. Aid should be given only to the truly destitute and not for free. In this spirit, the government put in place ill-conceived work schemes to alleviate the famine. When they failed, for some time during 1847 the government operated soup kitchens. During this short spell of running soup kitchens, the aid work quite very effective, showing that many could have been saved, but it was discontinued again returning to the dogma that nothing should be given out for free. There was constant suspicion as well. When some people started asking instead of cooked food for food to prepare at home they were deemed not to be destitute where in reality they did not like the demeaning affair of travelling to the soup kitchens and waiting in queue for long hours. During the famine the cultural oppression of Irish language and dress codes and traditions was pushed further for example with attempts to convert the Irish Catholics to Protestantism in a movement called ‘souperism’ where those who converted were fed. If you would like to find out more about the famine, here is a brilliant read that brings this period in Irish history to life- Tim Pat Coogan: The Famine Plot. Hi there, we hope you enjoyed reading this article on the potato famine as much as we did writing it! We do it with passion and love and all we ask of you is to please spread the word about us. Use the social buttons at the top left, or the social sharing boxes below.